It's rain season in Tsukuba. It started about a week ago and for the first days I wasn't aware and simply wondered why it wouldn't stop to rain. (I somehow thought rain season was somewhen in August although I already experienced rain season when I was in university so I should've known it couldn't be August since there is no university in August.) Luckily, it's not as hot as I was last time I was here so it's just very very rainy and you get very wet. I don't really care and go to university by bycicle anyway because waiting for the bus is such a bother and it takes me at least 20 minutes for a way I can do in 5 minutes per bike. Just get a second coat to change so you won't be freezing in your wet clothes and it's fine! 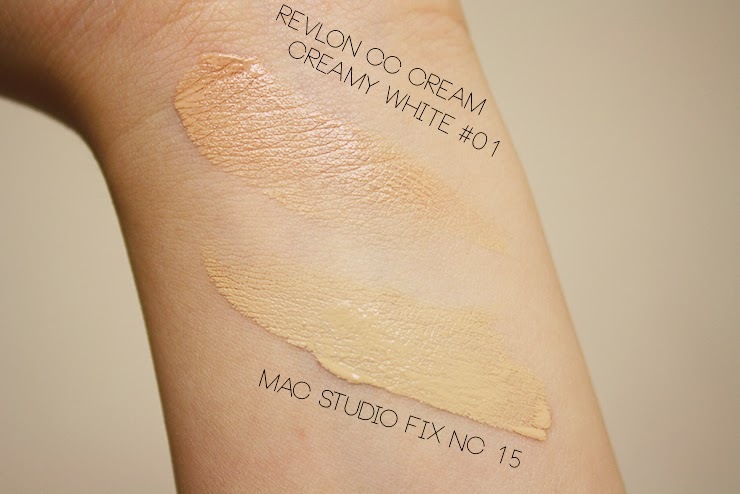 As you know I did buy the Revlon Absolute Radiance+ CC Cream in an impulsive moment a while ago and since a lot of you were interested I made some swatches today so you can judge for yourself. This is not a complete review because the color is so way off for me that I couldn't possibly write a review about this product :( However, I'll give you my opinion as far as I can say for sure. I honestly thought I couldn't do much wrong with the latest shade since I am pretty pale and Creamy White did sound as a.. well, just a really light creamy texture with some color I guess. However, the color is nothing like what I imagined it to be and unfortunately is just waaay too dark for my skin. 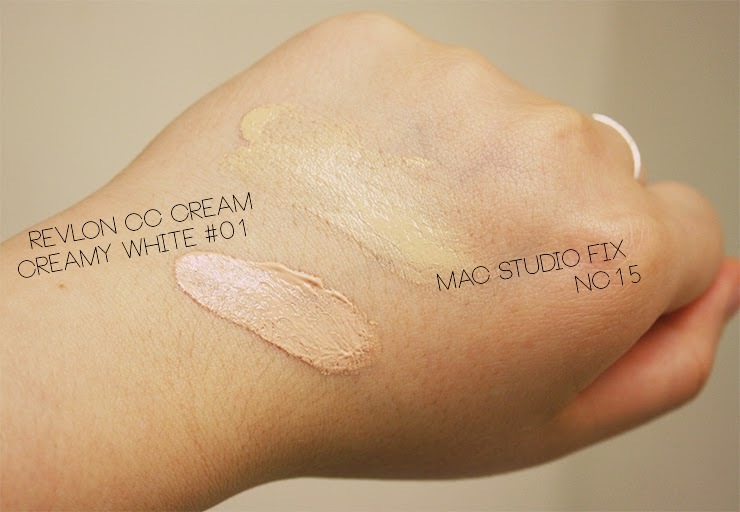 I swatched it together with my usual foundation MAC Studio Fix in NC15. In this picture it doesn't look so bad - however you can see the CC cream is a lot darker and much more "red" than my usual foundation which already blends into my skin by just swatching it on. Here you can say better just how dark it is for my skin. I think they should have called this "Creamy Peach" or something pecause it does have a lot of peachy/orange/red undertone to it. It's a shame there were not any testers because I would have never bought it if I'd known... but I was just so curious! // For some reason the color is not displayed so well in my pictures, imagine it to be a lot darker in reality. The consistency is quite thick, however when I applied it to my face I found it didn't cover my blemishes very well. I think I don't need to say that it looked ridiculously red on my face and if you have blemishes like I do I felt they just get enhanced by the warm undertone :( So if you have blemishes, this is not for you. At all. 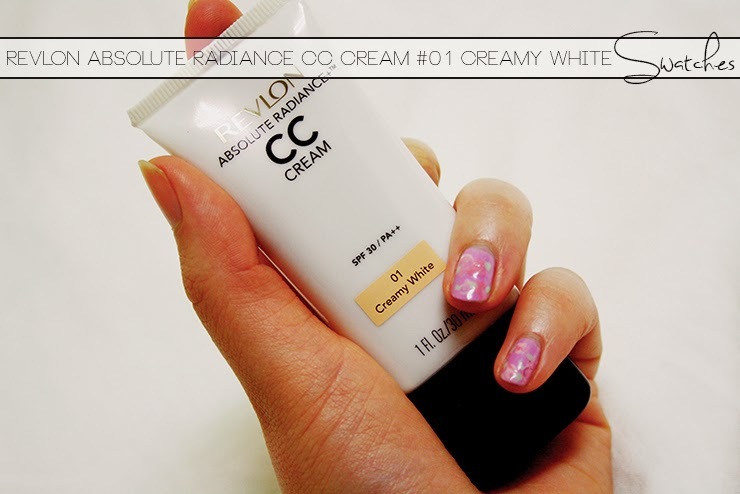 The CC Cream does have SPF 30/PA++ which I do like. The amount you get is standard for a BB or CC cream considering the price (1500Yen, about 12$) however I couldn't really see or feel anything that would have made it different from a usual BB cream... maybe CC Cream is just more fancy with three C in a row..? Needless to say, I will not repurchase it and advice you find a store where you can swatch it first because I think the color might not be suitable for a lot of people. Have a nice not-so-rainy week!